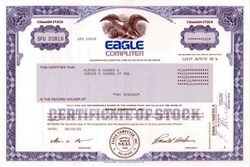 Beautifully engraved certificate from the Eagle Computer issued in 1985. This historic document was printed by the Security-Columbian Banknote Company and has an ornate border around it with a vignette of an eagle and the company logo. This item has the printed signatures of the Company’s President and Secretary and is over 17 years old. This is the first time we have had this certificate for sale. 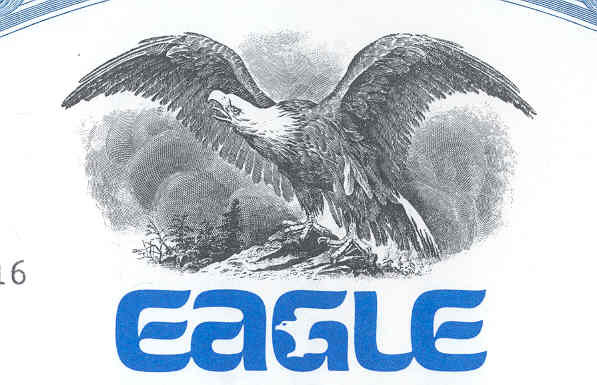 Eagle Computer's founder, Dennis Barnhart, had quickly established Eagle as one of the stronger PC-clone makers in 1983, and the company was slowly picking up market share as businesses and consumers took Compaq's lead and started embracing non-IBM machines. Eagle went public in June '83, and it was a big deal in both Silicon Valley and Wall Street, which gave Eagle millions of dollars in much-needed working capital and instantly made Barnhart a wealthy man. Barnhart was so ecstatic over the offering that he decided to treat himself to a new yacht. So, just hours after his company went public, the Eagle chief executive set out for lunch with a yacht salesman. But after lunch, Barnhart, who was at the wheel of his $70,000 Ferrari, failed to negotiate a turn not far from Eagle's headquarters in Los Gatos, Calif. He was pronounced dead soon after. The company never recovered from the loss and, despite great effort, became yet another casualty of the clone wars. In 1984, IBM sued Eagle Computer Systems for copyright violation of the IBM PC's BIOS, and won.